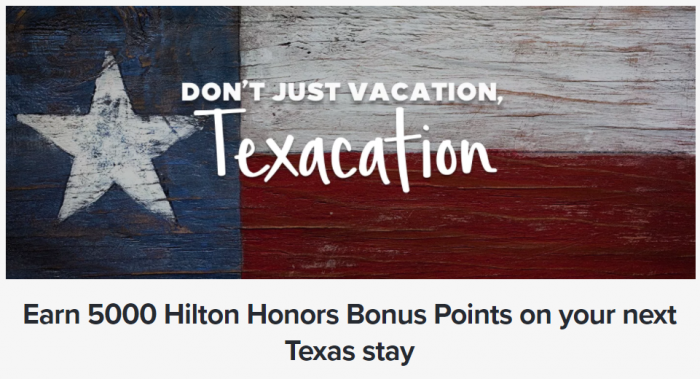 Hilton Honors has launched an interesting offer for stays in Texas that either comes with 20% off rates or 5,000 bonus points for stay(s) through December 31, 2018. Hilton is promoting this offer for stays in Austin, San Antonio, Dallas and Houston. The T&Cs are referring to a postcard that the member should show that I find very weird. These are usually tied to the rate plan booked. You can access the 5,000 bonus points offer on Hilton’s website here and the 20% off rate plan here. Interesting that Hilton has decided to launch two offers; one with the 20% discount and another one with the 5,000 bonus points. I guess that they can easily test and see what makes members click and book. Offer valid for Hilton Honors members and is subject to availability at participating hotels in Dallas/Fort Worth, Austin, San Antonio and Houston within the Hilton Portfolio for stays booked between 12:01am Eastern Standard Time, February 12, 2018 and 4:00am Eastern Standard Time, December 31, 2018 and completed between the periods of February 12, 2018 to December 31, 2018. Offer requires 2 nights minimum length of stay. Guest must show the postcard at time of check in. Valid one time use. Offer Valid Hilton Honors Membership is required to book the Hilton Honors Members rate. The booking must be made within the booked period specified herein. A limited number of rooms will be available for this offer. Bonus Points do not count toward elite tier qualification. Please allow six to eight weeks from completion of your stay for Bonus Points to appear in your account. A ‘stay’ is defined as the total number of consecutive nights spent at the same hotel, whether or not a guest checks out and checks back in again. Early departure fees may apply and vary by hotel. Unless otherwise stated, quoted rates are per room per night, based on single/double occupancy and do not include taxes, gratuities, incidental charges and resort fees (if applicable). Additional restrictions and blackout dates may apply and vary by hotel. If you are making this reservation by phone, please call +1-800-4HONORS or view all Hilton Reservations Worldwide phone numbers. This offer may not be combined with other select promotions, offer or discounts and is not valid for existing reservations or groups. Offer components are non-transferrable or redeemable for cash, and cannot be used during future stays. Hilton Honors™ membership, earning of Points & Miles™ and redemption of points are subject to Hilton Honors Terms and Conditions. Offer is subject to availability at participating hotels in Dallas/Fort Worth, Austin, San Antonio and Houston within the Hilton Portfolio for stays booked between 12:01am Eastern Standard Time, February 12, 2018 and 4:00am Eastern Standard Time, December 31, 2018 and completed between the periods of February 12, 2018 to December 31, 2018. Offer requires 2 nights minimum length of stay. Guest must show the postcard at time of check in. Valid one time use. The booking must be made within the booked period specified herein. A limited number of rooms will be available for this offer. The actual discount rate relates to the hotel’s Best Available Rate (“BAR”), which is a specific rate type that varies depending on time of purchase, is unrestricted, non-qualified and excludes discount rates. Early departure fees may apply and vary by hotel. Unless otherwise stated, quoted rates are per room per night, based on single/double occupancy and do not include taxes, gratuities, incidental charges and resort fees (if applicable). Additional restrictions and blackout dates may apply and vary by hotel. If you are making this reservation by phone, please call +1-800-4HONORS or view all Hilton Reservations Worldwide phone numbers. This offer may not be combined with other select promotions, offer or discounts and is not valid for existing reservations or groups. Offer components are non-transferrable or redeemable for cash, and cannot be used during future stays. Hilton Honors™ membership, earning of Points & Miles™ and redemption of points are subject to Hilton Honors Terms and Conditions. Next articleAir Asia Experiment – Can Flying On A Low Cost Airline Challenge The Experience Of A Full Service Carrier?